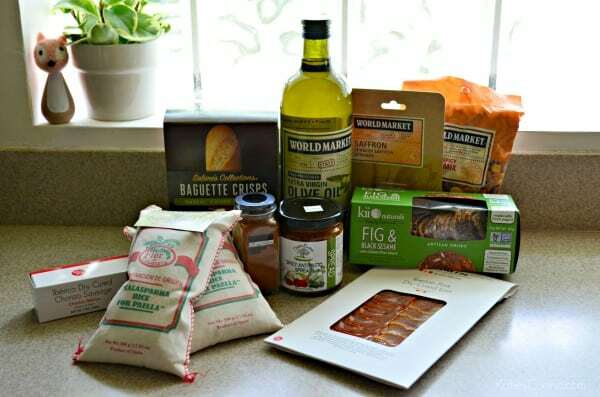 Thank you World Market for supporting my love for food and cooking and sponsoring today’s post. As always, all opinions are my own. 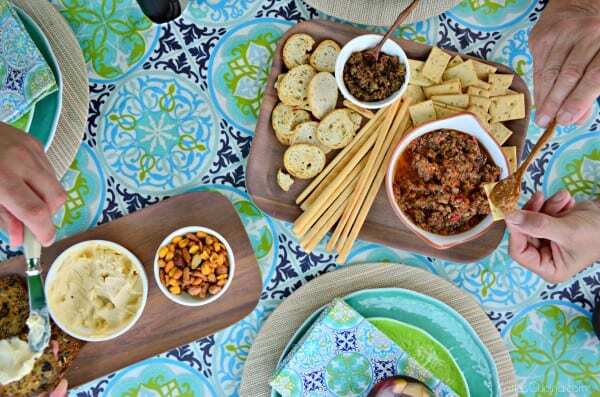 Summer is near, and that means lots of outdoor entertaining! Now that we have a home with a pool we find that we are enjoying our pool deck all the the time. 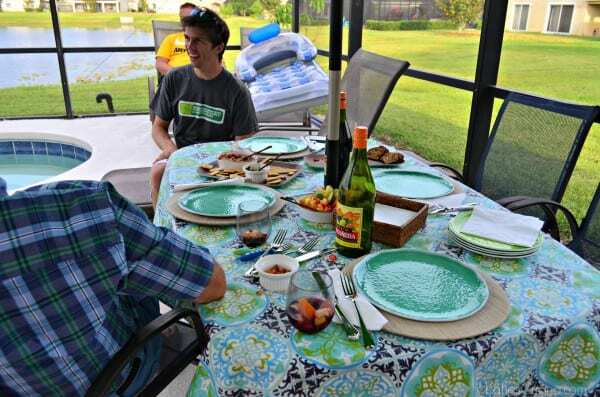 Thanks to World Market we’ve been able to update parts of our pool deck and make our existing patio table and chairs look new again with an oilcloth tablecloth, umbrella, and dishware. We also strung 3 strands of outdoor string lights to give our pool deck a nice glow at night! 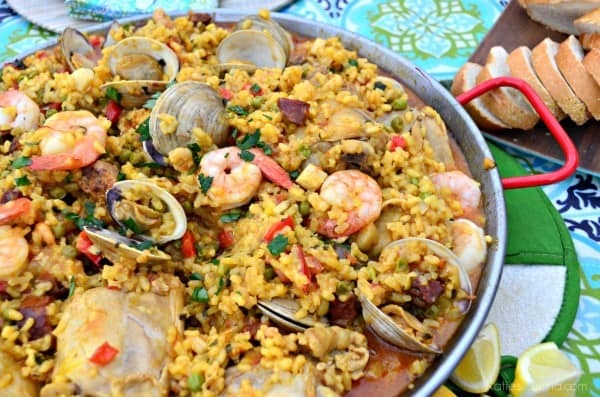 We most recently had my husband’s family over and hosted a seafood paella party! We had so much fun, enjoyed delicious appetizers (also known as tapas), lots of yummy sangria, and plates and plates full of seafood paella! The one thing that I always try to do when entertaining is pick a theme. I always start with the food. Duh! For this get-together I choose paella! 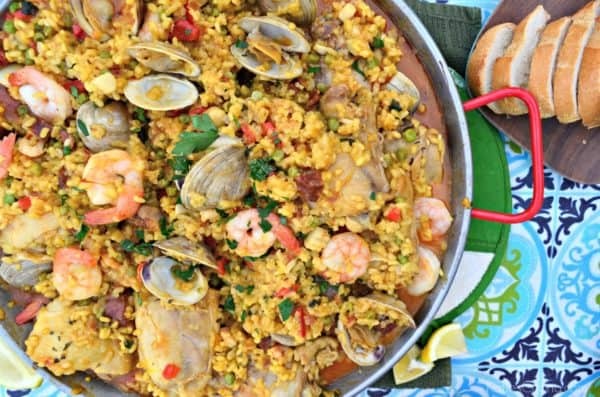 How fun is it to make a big vat of seafood paella to share with your family!? Since I knew that paella requires a lot of love and attention I opted to grab a bunch of crackers, spreads, and cheese from World Market. Plus I grabbed the rice, saffron, olive oil, chorizo, and cured ham for the Paella (and of course the Paella pan too). And don’t forget all the delicious sangria. Lots of items from today’s Paella party all from World Market. Before my guest arrived, I arranged my tapas platters, and as soon as they arrived I put them out for them to enjoy. I like a mix of cheese, tapenades, crackers, and nuts. 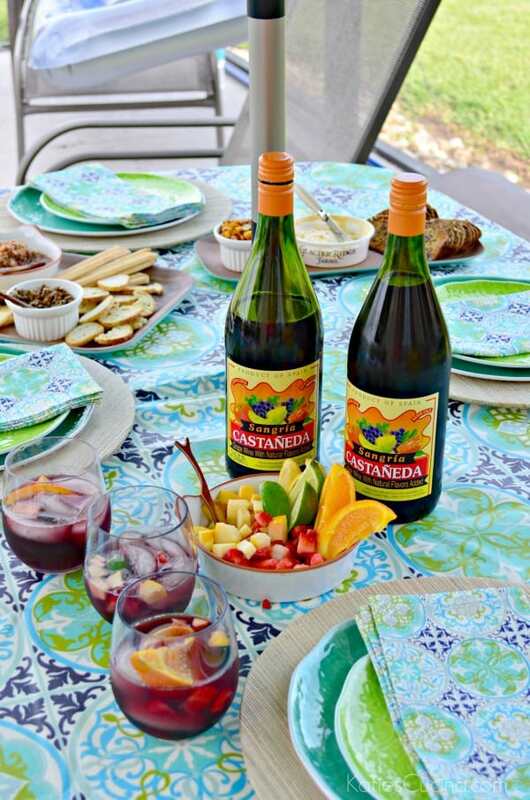 I also chopped fresh fruit like Opal apples, strawberries, limes, lemons, and oranges and put out a few bottles of Castañeda Sangria. 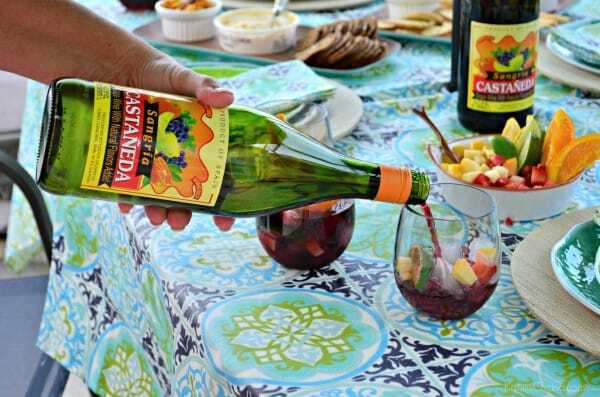 My guest could customize their sangria by squeezing in fresh juice and adding the apples and strawberries for crunch and flavor. Can I just tell you how delicious this pre-mixed sangria is? It has a refreshing blend of red wine and citrus fruit flavors. 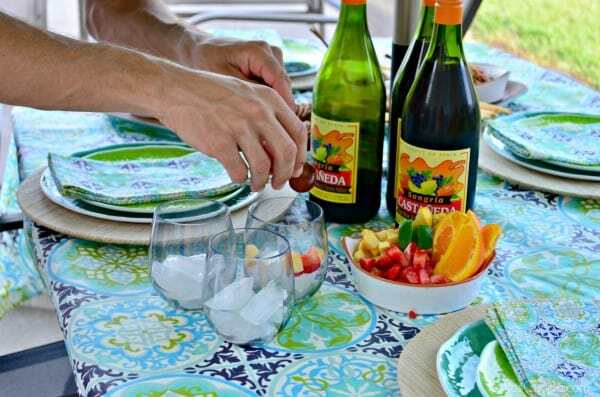 Just add fresh fruit and ice and your all set to go for your Paella party! Love keeping entertaining simple and letting my guest customize their drinks. So while, the guys enjoyed the company of each other (and watching the kiddos) my mother in-law and I tended to the paella. We each took turns prepping various items, she did the chopping of the veggies, garlic, and herbs. I cooked the meat, made the broth, and chopped the chorizo and pork. We each took turns stirring. 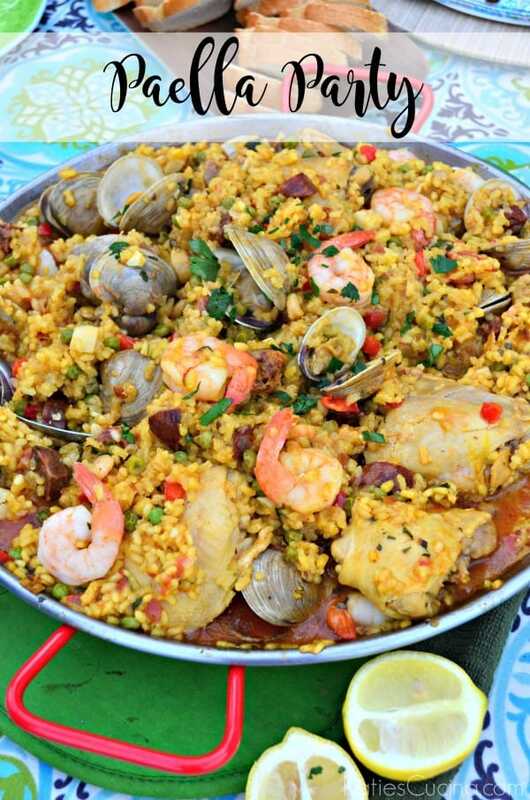 When making paella it’s best to keep the heat on medium-low to prevent burning. You also want to make sure your chicken thighs are cooked almost thoroughly before you add it back to the paella or else it will take much longer to cook. 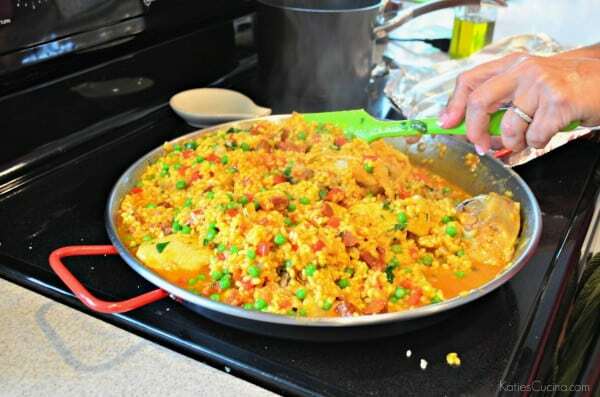 We found that by tenting the paella with tin foil it helped the rice and ingredients cook longer. You’ll also want to wait until the end to add the seafood. We nestled the clams into the rice when we added them to the pan. This helped them cook quicker. My seafood market did not have mussels when I went so we opted for clams. Any seafood works! Once you take your paella off the stove top carefully walk it to the table (make sure you have lots of hot pads underneath). I topped our paella with freshly chopped parsley and freshly squeezed lemon, table side. I also placed some cut lemons on the table for my guest to use once they scooped the paella on their plates. We removed the chargers before everyone started serving to preserve the longevity of them and boy I’m glad we did. We had rice and veggies everywhere! I served a white crusty bread and butter to go along with our big pan of paella. I love using the melamine and plastic glasses on our pool deck. It’s ideal for entertaining and just in case anyone drops a plate or glass I know we won’t have a big mess of glass to clean up! The kids were already done eating, so we took turns running in to check on them. 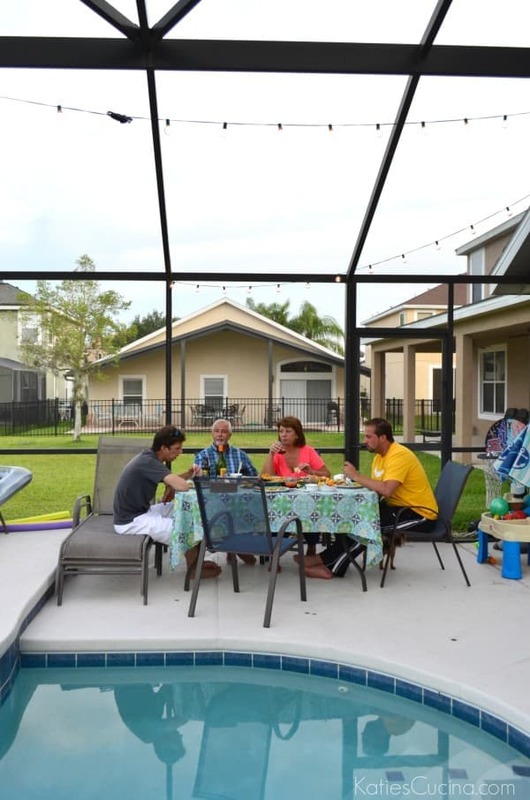 During one of the times I ran in to check on them I came back outside (we had a the patio door open and they were all watching a movie in the family room–we could hear everything they were saying), and saw my husband and his family sitting and enjoying the meal that my mother in-law and I cooked together. It simply warmed my heart and I just had to capture a natural photo of this fun meal together. Real life–with pool floats and sand tables next to us. We all had a great dinner and loved every minute of it. The sun was just starting to go down and we turned our string lights on (and removed our umbrella so we could put the paella in the center of the table). This picture doesn’t do justice for what I witnessed during our paella party. But it sure does warm my heart. Looking for other ideas on how to entertain this summer? My friend Brandi Milloy is sharing 3 Stylish Theme Parties for Summer: Pick from 3 party themes curated by lifestyle expert Brandi Milloy! From Havana Summer Nights’ bold colors, California Coastal’sCoastal modern nod to light woods and indigo, and a game-filled Kids’ Day Camp theme, there’s something fun for everyone! 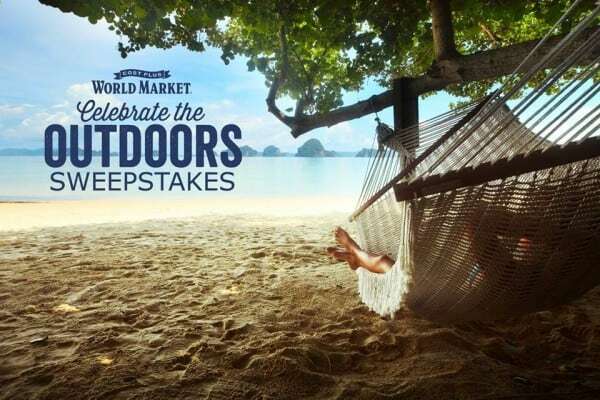 Celebrate the Outdoors Sweepstakes with Cost Plus World Market. Enter for a chance to win a Trip to Maui with Cost Plus World Market! 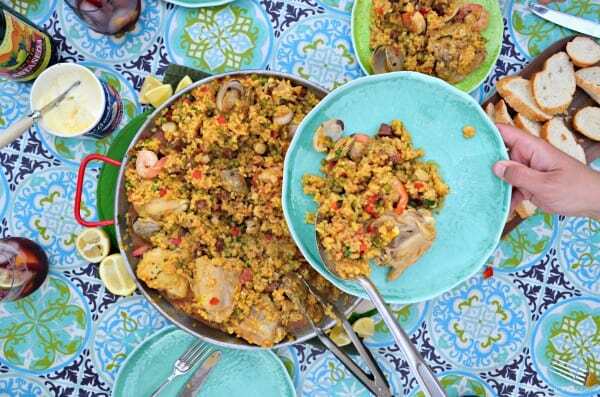 So if your ready to kick off the warmer months with family and friends I highly suggest you head over to World Market and pick up items to create your very own Paella Party! 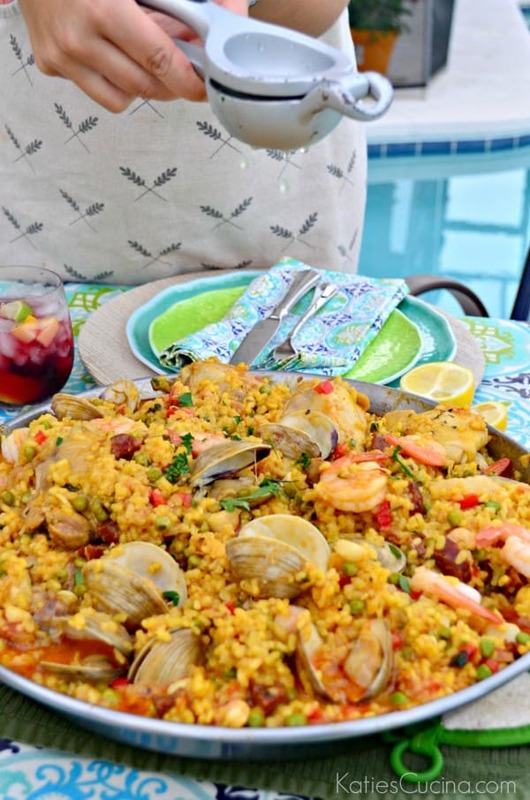 Heat 1 tablespoon oil in a large paella pan or large skillet over medium-high heat. Add chicken; saute 5 minutes on each side or until almost cooked fully. Remove from the pan and set to the side. Add sausage and Iberian Pork Dried Cured Loin; saute 2 minutes. Reduce the heat to medium-low. Add onion and bell pepper; saute for 2 minutes, stirring occasionally. Then add tomatoes, paprika, and 3 garlic cloves minced; cook 5 minutes. Add rice; cook 1 minute, stirring constantly. Add the chicken thighs back to the pan and pour half the broth on top. Bring to a low boil; cook 35 minutes, stirring frequently. *Tent with aluminum foil to help the rice cook faster. As the broth begin to absorb into the rice add additional broth until almost all of the broth is used up. Add in the green peas, mix well and cook for 5 minutes longer. Once the chicken is almost cooked, stir in herb blend, bay scallops and salad shrimp. Mix well then, add the clams, jumbo shrimp to the pan, nestling them into rice mixture. Cook 15 minutes or until shells open; discard any unopened shells. Top with freshly chopped parsley and squeeze juice of one lemon on top before serving. Serve with additional lemon wedges and crusty bread.